Place all dressing ingredients in bullet-style blender or mini food processor, and whirl until dressing is creamy and smooth. Season to taste with salt and pepper. Let dressing stand in refrigerator for up to 24 hours before using. Makes 1/2 cup dressing. Divide greens between 2 salad plates. 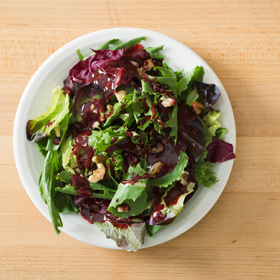 If using cheese, set a slice in center on top of greens and drizzle 2 tablespoons of blackberry vinaigrette over salad before serving. Or drizzle on dressing and sprinkle walnuts on top. Garnish with 3 or 4 whole blackberries. Reserve remaining dressing for another use. It keeps covered in refrigerator for 3 days. Serving size: 1/2 of recipe. Amount per serving (with goat cheese): 150 calories, 11g total fat (4g saturated fat), 9g carbohydrates, 4g protein, 3g dietary fiber, 99mg sodium.